Home / Modern Pest Blog / Are You A Mosquito Magnet? 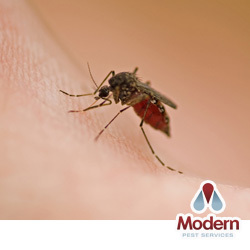 Learn the reasons why you may be attracting mosquitoes and mosquito bites. Have you ever noticed that you get bitten by mosquitoes just by stepping out of your home in the summer time? If the buzzing biters are chasing you indoors during the summer time, but your friends and family members seem unbothered by these pests, it may not just be your imagination; you may actually be a mosquito magnet! Well, not literally, but there may be things about your habits or your physical make-up that make you more attractive to biting mosquitoes. There is evidence to show that both your metabolism and your unique body chemistry can play an important part in determining how much of a mosquito magnet you are. Here are several factors that may determine how attractive you are to mosquitoes. Do you have blood type O? Believe it or not, mosquitoes can tell and they prefer you if you have type O blood. They are nearly twice as likely to land on you if you have blood type O over blood type A, according to a Japanese study. Apparently most people secrete substances that allow mosquitoes to recognize blood type before they chow down on your blood. Do you have stinky feet? If so, mosquitoes may find you far more delectable. In this study done by Dutch scientists, a graduate student sat in his underwear under a mosquito net, waiting to attract mosquitoes. It was noted that when mosquitoes were allowed into the netting, nearly three quarters of the mosquitoes that landed on him went straight for his stinky feet. After washing his feet, mosquitoes landed randomly on his body and didn’t go straight for his feet. They also determined that mosquitoes are attracted to stinky cheeses, which contain the same smelly compound responsible for foot odor. Are you pregnant? If so, you could be attracting more mosquitoes! Because the pregnant belly runs nearly a whole degree warmer, mosquitoes may be attracted to more of the substances that are released in pregnant women’s sweat. Pregnant women also exhale 21 percent more volume, which may attract more mosquitoes because these pests are attracted to moisture and carbon dioxide in their breath. There may even be evidence that women are more attractive to mosquitoes during certain phases of the ovulation cycle, but the jury is still out on that. Do you drink beer? If the answer is yes, you may be making yourself more attractive to mosquitoes. According to a study published in Journal of the American Mosquito Control Association, drinking just one bottle of beer can significantly increase your chance of being bitten. The study that was done compared mosquito activity with people before having a drink and after, finding that after beer ingestion, mosquito landings significantly increased. Are you wearing dark clothing? If so, you might be increasing your risk for attracting mosquitoes. In one study, researchers found that black and red clothing is especially attractive to mosquitoes, while grey and blue clothing is neutral and khaki, green, light khaki and yellow are less attractive to mosquitoes. So if you’ve ever wondered why mosquitoes seem to like you so much, it’s not just because of your charming personality! There are actual physical preferences that mosquitoes have and if your body or your scent (or even your clothing) fit the bill, you could be attracting more mosquitoes. So what can you do? Besides covering up your skin with light colored clothing and making sure to shower regularly (and scrub those feet! ), you can contact a pest control professional like the folks at Modern Pest Services, serving areas of Massachusetts, New Hampshire and Maine since 1945. We are a 3rd generation family owned and operated pest control company and we offer mosquito control solutions as well as many other pest control options for pests that may be bothering you. Contact us today for more information on our mosquito control services and let us show you why we are New England’s largest and fastest growing pest control firm.